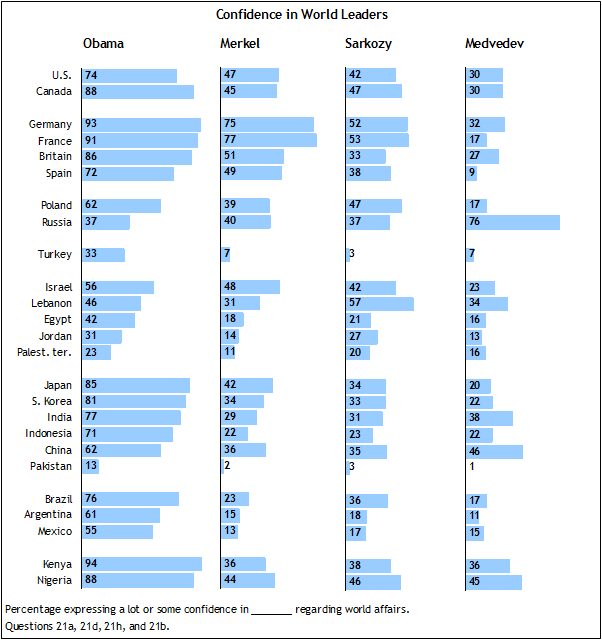 None of the European leaders tested in this survey achieve the high levels of praise that are bestowed upon the new U.S. President Barack Obama. Even German Chancellor Angela Merkel, who receives positive marks throughout much of Western Europe, does not match Obama’s high levels of support. In contrast to Merkel, French President Nicolas Sarkozy fares far less well among his fellow Europeans. The relatively new Russian President Dmitri Medvedev receives mostly negative ratings in much of the world. Majorities in three of the four Western European countries included in the survey have confidence in German Chancellor Angela Merkel to do the right thing regarding world affairs. However outside of Western Europe, there is less confidence in Merkel, and many are unfamiliar with the German leader. Confidence in Merkel is widespread in both France and Germany. Almost eight-in-ten in France (77%) have confidence in her to do the right thing in foreign affairs, down slightly from 84% in 2008. Three-quarters of Germans express confidence in Merkel, essentially unchanged from last year. About half in Britain (51%) and Spain (49%) have confidence in her. While positive evaluations surpass negative assessments in Russia, (40% confident vs. 25% not confident), confidence in the German chancellor in Russia declined by nine percentage points over the last year. In the United States, more express confidence in Merkel’s foreign policy skills than take the opposite view (47% confident vs. 24% not confident), though almost three-in-ten (29%) are unable to offer an opinion on her. Similarly, more in Japan offer positive than negative assessments of the German leader (42% vs. 23%), but again many admit they are unfamiliar with her (34%). Negative views of Merkel are more pervasive in the Middle East than in any other region. Majorities in the Palestinian territories (73%), Egypt (70%), Jordan (69%) and Lebanon (64%) have little or no confidence in Merkel to do the right thing in world affairs. Views of Merkel are equally divided among Israelis (48% confident vs. 48% not confident). Consistent with previous surveys, most in Turkey have little faith in Merkel’s foreign policy decisions. Currently, two-thirds of Turks do not trust Merkel’s judgment in foreign affairs, while only a handful say the opposite (7%). Elsewhere, many around the world are unable to offer an opinion either way on the German chancellor. Half or more in India, Indonesia, Mexico, Argentina and Pakistan are unable to assess Merkel’s ability to handle world affairs. Western European publics express less confidence in French President Nicolas Sarkozy than in German Chancellor Angela Merkel. And, similar to Merkel, Sarkozy receives his most negative assessments in the Middle East. Slim majorities in France (53%) and Germany (52%) say they have confidence in Sarkozy to do the right thing regarding foreign affairs. But opinions of Sarkozy in these nations are far from decisive – 47% in France and 43% in Germany have no confidence in the French president. More in Spain have little or no confidence (54%) in Sarkozy’s foreign policy skills than have confidence (38%). In Britain, the percentage expressing confidence in Sarkozy has dropped dramatically since last year. In 2008, a majority of the British (53%) felt confident in Sarkozy, but today just 33% feel the same way. Roughly four-in-ten (42%) in the U.S. have a lot or some confidence in the French president, while a third (33%) have little or no confidence in him. Among Canadians, almost half (47%) say they have confidence in Sarkozy’s ability to handle world affairs, while fewer (31%) say that they do not have confidence in him. With the exception of the Lebanese, majorities across the Middle East countries surveyed lack confidence in Sarkozy to handle global affairs. Many the Palestinian territories (72%), Egypt (68%), Jordan (65%) and Israel (56%) express little or no confidence in Sarkozy to do the right thing in world affairs. On the other hand, almost six-in-ten in Lebanon (57%) have confidence in the French leader. Substantial proportions in Turkey (73%), Pakistan (66%), India (59%), Indonesia (54%), Mexico (52%) and Argentina (49%) are unable to offer assessments of the French president. Confidence in Russian President Dmitri Medvedev to do the right thing in world affairs is low. In no country –outside of Russia – does a majority express confidence in Medvedev to do the right thing regarding global affairs. The Russian president receives his highest rating among his own people – about three-quarters of Russians (76%) say they have a lot or some confidence in him. Among the European publics surveyed, most doubt the Russian leader’s ability to do the right thing when dealing with foreign policy issues. Strong majorities in Germany (63%), Poland (69%), Spain (70%) and France (80%) hold negative opinions of Medvedev. In Britain, views of the Russian president are on balance negative (49% no confidence vs. 27% confident). And in Turkey, 64% say they have little or no confidence in Medvedev. Similarly, negative views of President Medvedev are widespread among all of the publics surveyed throughout the Middle East. Large majorities in Egypt (78%), Israel (74%), Jordan (73%), the Palestinian territories (72%) and Lebanon (58%) do not trust the judgment of the Russian leader in world affairs. In only three countries – excluding Russia – is the balance of opinion on Medvedev mostly positive. In China (46%) and Nigeria (45%), pluralities express confidence in his foreign policy skills. In Kenya, slightly more have confidence in him (36%) than do not (30%); about a third (34%) offer no opinion. The change in Russian leadership in May 2008 did little to boost confidence ratings around the world in Russia’s leadership. Overall, Medvedev receives very similar ratings to former president, and current prime minister, Vladimir Putin. Despite worldwide skepticism of Medvedev, he remains popular at home – but not quite as popular as his predecessor. 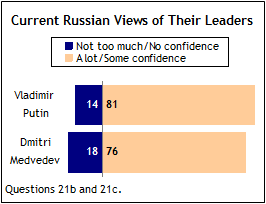 Strong majorities of Russians express confidence in both their president (76%) and prime minister (81%) to do the right thing in world affairs – but just slightly more express confidence in Putin than in Medvedev. Moreover, the high profile role Putin appeared to play in international and domestic issues over the last year is reflected in Russian opinions over who is in charge. 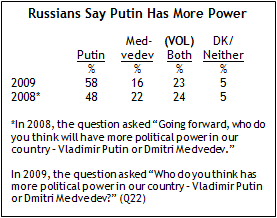 Almost six-in-ten Russians (58%) believe that Putin has more political power in the country than President Medvedev. Fewer than one-in-five (16%) believe that the president has the most political power, and just about a quarter (23%) volunteered that the two leaders share power together. By contrast, last year following the 2008 presidential election in Russia, roughly half of Russians (48%) expected Putin to have more power than Medvedev. But roughly equal percentages felt either that Medvedev (22%) would be more powerful or volunteered that both (24%) leaders would share their hold on the reins of power.